The good vibrations that Brian Wilson experienced in 1966 were of the extra-sensory kind, not conceived of the summer of love activities The Beach Boys officially represented. The lyrics by Mike Love on 'Good Vibrations' celebrated his affection for summer daze, but by 1966 Wilson was experimenting not only with sound, but also with substances, and his disinclination to surfing and surfing culture was well known. So, on The Black Angels cover of ‘Good Vibrations’ (which was recorded at the 1966 sessions but didn’t appear on Pet Sounds) they return the song to its true genesis, a song about the workings of the mind, and a paradigm shift from the flower power allusion/illusion. A tribute album from the organisers of the Levitation Festival in Austin, which this year was to feature Brian Wilson singing Pet Sounds in its entirety, seems well overdue, given the amount of influence Pet Sounds has had over two generations of musicians not only with a love of pop music, but also psychedelia in all its musical forms. It’s fascinating, on the subject of Brian Wilson’s divergence from commercially favourable ideas and music, to hear on this tribute the two versions of the song originally titled ‘Hang On To Your Ego’, the song which later morphed into ‘I Know There’s An Answer’. The latter iteration was included on Pet Sounds in its censored form. It wasn’t until later editions of Pet Sounds that ‘Hang On To Your Ego’ appeared. The original, 'Hang On To Your Ego' was thought by the band to have too obvious a reference to LSD usage, a confessional about Wilson's own mind bending experiences. Wilson relinquished the original’s biographical narrative, and allowed the lyric on ‘Hang On To Your Ego’’ to be modified so it appeared that Wilson was remonstrating against drug experimentation. This rather moralistic juxtaposition is reflected in the UFO Club’s unhinged psychedelic acid-trip version of ‘Hang On To Your Ego’ , as against Christian Bland’s almost perversely hymnal reading of ‘I Know There’s An Answer’, sounding intentionally pious. 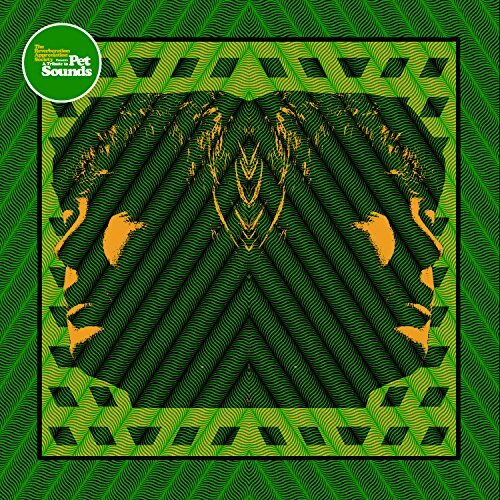 The experimental sounds on Pet Sounds were augmented by an array of what must have been thought to be very unusual instruments in 1966, harpsichords, theremin, flutes, multi-layered harmonies, even coca-cola tins, steam trains and barking dogs. However, Pet Sounds wasn’t overall a radical departure from the sounds that made the Beach Boys famous. Despite his musical restlessness, and his failing mental health, Wilson still wanted to make an album full of hits, so on Pet Sounds there’s plenty of sweet melodies. On tracks such as ‘God Only Knows’ and ‘Here Today’, Chris Catalena and Cool Ghouls respectively pay homage to the songs without any wilful distortions, distortions that work much better on tracks such as ‘I Just Wasn’t Made for These Times’, ‘Let's Go Away For a While’ and ‘Caroline No’. Wilson was a brilliant songwriter, and a master of the hook, and it would be unwise to cover many of these songs without deferring to the perfection of the originals. There’s only a couple of mis-starts in that regard. One is Morgan Delt’s version of ‘Don’t Talk’ (Put Your Head On My Shoulder) where the orchestral sounds of the original are replaced by synths, and the original's charm is displaced. The yearning of the original vocal is also missing. The Shivas supplant the playfulness of ‘I’m Waiting For The Day’ and cannot, and do not, match the lustrousness of the BB’s harmonies in the chorus. Highlights include The Black Angel’s sardonic reading of ‘Good Vibrations’ complete with ten seconds of rotor-blade guitar fuzz and effects emulating vibration; Night Beats’ progressively cow-punk version of Sloop John B with loads of jagged reverb; Burnt Ones’ dark noir version of ‘Pet Sounds’, incongruously referencing some of the original's samba, and UFO Club’s bad comedown version of ‘Hang On To Your Ego’. Overall, an excellent tribute which demonstrates Brian Wilson’s mind's eye better than the indie music distortions of the ‘Do It Again’ compilation last decade. Good review. I'm usually skeptical of covers of classic albums, but I need to check this one out. Thanks Justin. For another interesting comparison, compare Black Angels 'Bad Vibrations' from Phosphene Dream, with 'Good Vibrations' from this !